Both highly suspenseful and deeply emotional, ROOM is a unique and touching exploration of the boundless love between a mother and her child. After 5-year old Jack and his Ma escape from the enclosed surroundings that Jack has known his entire life, the boy makes a thrilling discovery: the outside world. As he experiences all the joy, excitement, and fear that this new adventure brings, he holds tight to the one thing that matters most of all—his special bond with his loving and devoted Ma. I caught this movie as a secret preview from Shaw. This means, I had no notion what movie it will be. When the title appear, I thought it will be a horror story. Well, I’m not exactly wrong. “Room” is indeed a nightmare retold from the perspective of a 5 year old kid. A nightmare that belongs to his mother. Watching this film with zero knowledge made me really sensitive and observant. Is it a horror film? Will there be something coming out from somewhere suddenly? 5 minutes into the film, I let my guard down and start noticing the little nuances, the nook and crannies which Jack gave a name and personify. When the realisation of what the two characters were trying to do dawned upon me, I was overwhelmed. Mind you, I’m watching this film without knowing what this film is about! Jack (Jacob Tremblay) and his Ma (Brie Larson) were living in this world created and confined within this room. If you’ve heard about the proverb (井底之蛙) – frog living at the bottom of the well, that’s the life both of them are living, literally. The performance of these duo was flawless and amazing. Should I even use the word ‘performance’? I did not even feel that it was an act. It was a struggle. It was a relationship. It was real. I was amazed how a kidnapping case can be delivered in such an innocent yet unsettling way. The film surprised me in many way. When I thought the rescue would be the climax, it did not hit me as hard as I thought it would. I thought I will hate ‘Old Nick’ (Sean Bridgers) – the kidnapper, but Jack didn’t hate him, and I (the audience) am Jack, so I didn’t hate him. Everything is seen from a new perspective, like a newborn. What made me teared was the moment when Jack’s grandfather (William H. Macy) made his entrance – I burst into tears almost immediately. It was then I realised that I have been brought along on the surreal rescue emotional journey, and reality only hit then. The second moment was the interview that Joy (Brie Larson) was made to do in return for the money required for the lawsuit. Having accompanied the mother-son through their escape journey, the questions from the host/reporter suddenly seem so invasive, tactless and cruel. Suddenly, I saw how a simple question could destroy a brave mother’s foundation of strength and confidence. It was gut-wrenching. The suffocating enclosed ‘Room’ has open my eyes, mind and heart further, wider and deeper into the life of a kidnapped victim. The muted pain, the silence screams and the loud love were never shown yet felt throughout the film. A must watch. A film adaptation from the best selling novel, Room. The author, Emma Donoghue, conceived the story after hearing about five-year-old Felix in the Fritzl case. The case concerns a woman who was locked in a basement by her father who impregnated her with seven children, including Felix. In several interviews, the author of the book on which the movie is based has said the story is not based on any specific real-life case. Shailene Woodley and Brie Larson were the final two actresses in consideration for the lead role. Jacob Tremblay, though an experienced actor, could not bring himself to yell at Brie Larson in the scene where he is angry about his birthday cake having no candles. Finally the director had the entire cast and crew start jumping up and down yelling and screaming until he was able to do it himself. One of the stories that Ma tells Jack is about the Count of Montecristo, whose main character was imprisoned in one cell for many years as well. Brie Larson isolated herself for a month and followed a strict diet in order to get a sense of what Ma and Jack were going through. She avoided washing her face while filming in the Room, to really make clear on-camera that she was not wearing makeup. She spent six months in pre-production, studying the effects of sexual abuse, as well as reading about people in solitary confinement and captivity. She spoke with nutritionists about vitamin deficiencies, and stayed out of the sun for months, which “makes you look really strange in L.A.” She worked with a trainer to lose weight, but also build up her muscle; she ultimately achieved just 12% body fat. Check out Room Movie Official Website and Facebook Page! 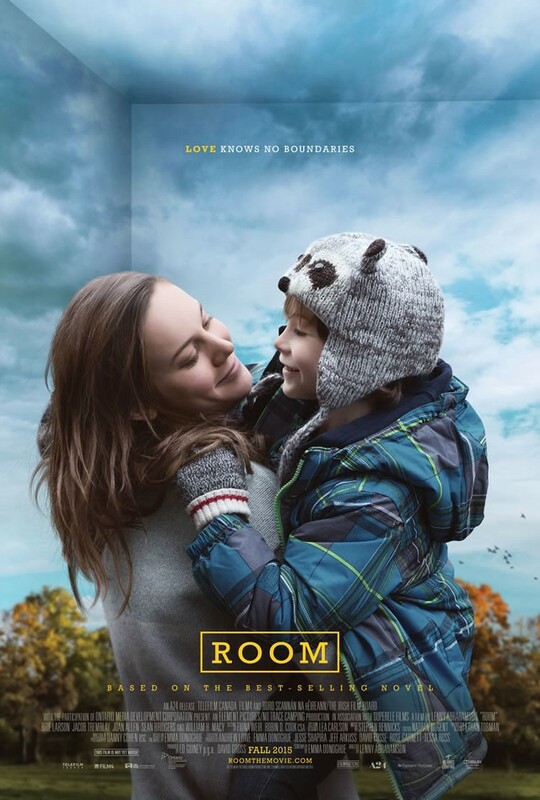 Room Movie is out in cinemas on 14 January 2016. *Disclosure: Invitation from Shaw Singapore. No monetary compensation was received for the movie review. Interesting. I’d love to watch how Brie Larson applied all her research to the role. It’s definitely an intense part and by the sound of it the movie was very moving. Such a very touching story. I wish more movies like this will be made and released. Good review, by the way. Yet to see this. But it seems it is worth it from your review. Reading your review made me want to see it for myself! I am a fan for these kinds of movies because it really brings me in the perspective of the victim in which I wish never will happen to me… But the trip of feeling what their feeling… Is just too delicious not to know about. I like this kind of emotional movie sometime. It really makes me appreciate life more. This was one of the best films I saw this year. In the beginning it was difficult to get into because of the strange behavior of the little boy. However, as the story progressed you realize how great the acting of Jason Trembley was to make this child so real! He should have been nominated for Best Actor Oscar. I was disappointed that he wasn’t, but glad Brie Larson seems to be a lock to win the Oscar for Best Actress. Just reading through your review almost made me cry. As I read it, I’m realizing I don’t remember the last time I saw a movie without knowing anything about it!!! It’s seems like a really complicated plot but a really touching one at that. Being confined to a room can really change people’s perspective. I haven’t seen this movie yet but I do imagine it will be a great one. I think Brie Larson is a talented actress and this movie will definitely challenge her skill set. I can say…she definitely worked hard for this role so no matter what…I’m impressed and I know this movie will be amazing. Thanks for sharing! Keep it up! What a touching story. I’ve read about this movie before, I had no idea it was already released! Thanks for sharing this review, it’s definitely touching and inspiring.